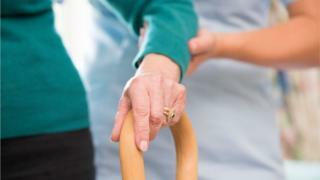 Social care workers in Scotland often face "excessive" shifts and unfair conditions, an inquiry has found. The convention, which advises the Scottish government, called for a watchdog to monitor working conditions and draft a "fair work" contract. Scottish Care, which represents care providers, said too many authorities purchased services "on the cheap". It concluded that more than 200,000 people worked in social care in Scotland - 7.7% of the workforce - with about 82% of them women. The figure, from Scotland's social services regulator, includes occupations such as home care workers, residential carers, social workers, nurses and childcare staff. She added: "It is concerning to see that this is not currently being realised, mainly due to issues caused by existing funding and commissioning systems, and the lack of an effective voice for workers. "The findings highlight the urgent need for policy makers, commissioners and leaders in the social care sector to work together to set minimum fair work standards for the social care workforce, and provide the opportunity for ongoing dialogue and agreement on workforce matters." National director Karen Hedge said: "To be able to have fair work conditions you have to have fair commissioning. "At the moment we have unfair market conditions which means effectively there is one sole buyer, mostly the local authority and that drives down prices, and certainly devalues social care." "Commissioners push for output, not for outcomes and they continue to measure the way we deliver social care in time, which can never measure the impact that care can have," she added. She said a solution would require better funding and addressing issues such as skill development that were squeezed when commissioners tried to purchase social care "on the cheap". Stuart Currie, spokesperson for health and social care for the council umbrella body Cosla, welcomed a debate on how to better value and reward the workforce. He said: "To address the challenges raised by this report, councils must continue to work with a range of partners, including third and independent sector providers and the trade unions, to ensure social care is a rewarding and attractive career. "This goes beyond remuneration and working conditions and includes a focus on career opportunities and pathways for these staff. "Increased demand for services, coupled with the challenging financial context councils are operating in, mean that we need to work with providers and staff to drive innovation in how social care is delivered." The statement said: "We are committed to improving social services and the quality of care, and we agree with the Fair Work Convention that enhancing fair work for social care workers is crucial to ensuring a workforce for the future - and to delivering high quality social care services to some of our most vulnerable citizens. "Later this week we are publishing a fair work action plan. This builds on the fair work framework and the first minister's announcement last year to adopt a new default position, termed 'Fair Work First'."